UBDATE 2018: uber no longer operates in Manila and has been replaced by grab – read how to use grab at Manila NAIA Airport instead! When you are arriving in a strange airport and have to deal with taxis, your trip can be off to a rough start, especially in developing countries, with frequent hassles, scams and annoyances. Uber is a great alternative, offering set prices without tipping, safety of knowing the driver and no risk of being taking for a ride with receipts including a map of the drive! Read my insider tips on how to best use them at Manila’s confusing airport, avoid the long taxi lines and high fixed fares! UPDATE: As of April 16, 2018, uber has shut down operations in Manila and is no longer available. Grab acquired uber’s South East Asian operations and is currently the only ride-hailing app in Manila. Manila’s Ninoy Aquino International Airport (NAIA or MNL) is fairly well organized with metered and fixed fare taxis available (read my taxi tips here), yet still “features” the touts so common in the region who are trying to trick you into overpriced transport. 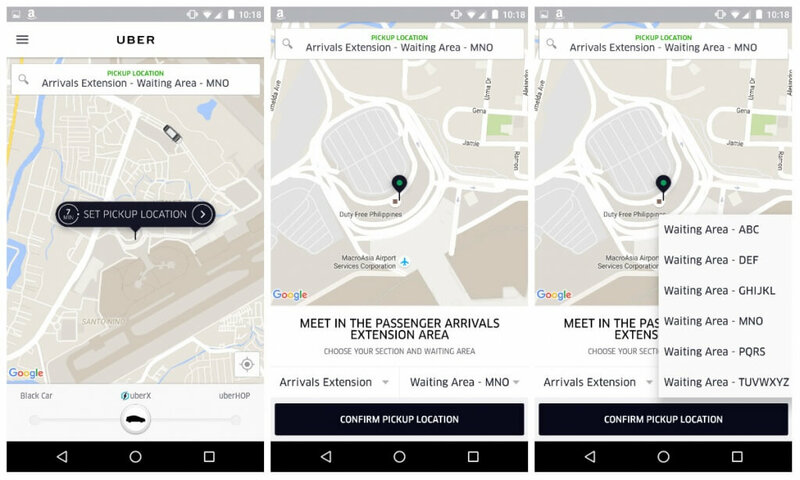 You’ll also face long lines for the metered taxis and high prices for the fixed fee taxis, but now you can use uber from the airport – uber introduced some new features making it easy for the first-time visitor to Manila to arrange for uber from the airport. The first thing you need is a data connection for your smart phone. You can activate roaming (convenient), buy a local SIM card for your phone or tablet at the airport or just use free wifi at the airport! Just turn on wifi and look for an open network (“Globe” is one of the official providers and safe to use) and sign in. You have to accept the terms and conditions and might have to launch your browser to do so. Terminal 3 is the new international terminal, also used by all Cebu Pacific and some Philippine Airlines domestic flights. International flights of Air Asia, All Nippon Air, Cathay Pacific, Cebu Pacific, Delta, Emirates, KLM, Singapore Airlines and Tigerair arrive here. Once you get through immigration and exit from the baggage area, you should be able to get wifi and launch uber. Wifi should reach to the curb for pickup, so you can go outside and still see the car. You will be greeted with a welcome screen by uber. Once past that, click on the “Pickup location” at the top of the screen – you will get the option to specify point at the terminal you want to be picked up. Select a “Bay Number” from the pull-up menu at the bottom left – Bay 1 is all the way to the left once you exit, Bay 8 is to the right. If you exit to the right from the luggage area and follow the taxi signs, you’ll exit near “Bay 8”. The bay numbers are marked on the pillars at the curb and you will be able to see the huge signs as soon as you exit the building. Your driver will meet you there. Make sure to look at the license plate – a lot of the uber cars are the same make & model! Insider Tip 1: Frequently, an uberx car dropping off a passenger at arrivals will accept your ride. While the map shows the car right in front of you, it’s really above you and the driver will have to exit the airport and loop around, which can take anywhere between 10-45 minutes, depending on traffic, so be prepared to wait or cancel and take a fixed-fee taxi if you are in a hurry! Terminal 2 is dedicated to Philippine Airlines and all their international flights arrive there. Connect to wifi while you are in the luggage area and call an uber as soon as you exit. The pick-up area is near the terminal and wifi should reach out to the curb. Click on the “pickup location” (top of the screen) to specify the place to meet and select a “Bay Number” (pull-up menu, bottom left corner of screen) to specify your pick-up location. The bays are numbered from 2 (far left side of terminal when exiting domestic arrivals) to 11 (middle of terminal, between domestic and international) and to 23 (far right side of terminal when exiting international. You can see them marked on the pillars curbside. Make sure to pick the bay number once you see them – it’s a long walk from one end to the other! Terminal 1: All remaining international flights not listed at Terminal 2 & 3, arrive at the old (recently refurbished) Terminal 1. You’ll be able to call an uber from the terminal and have to specify the pick-up location with a letter. Typically, people go by the first letter of their last name. 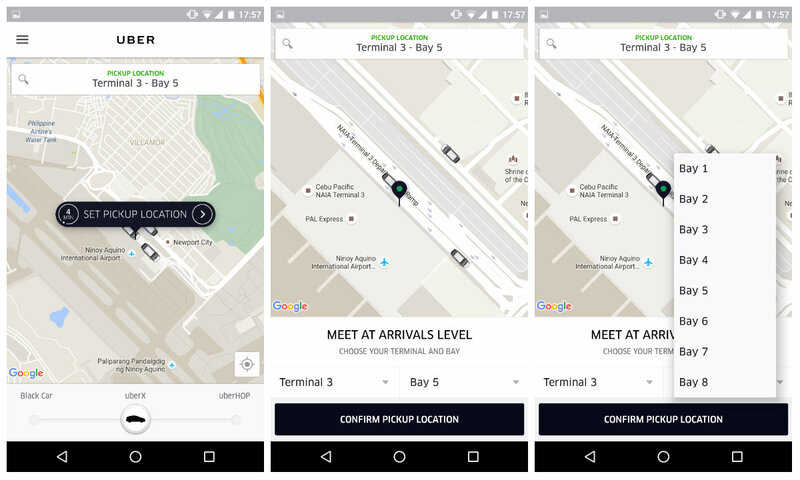 Make sure to request the uber and wait for the car assignment, before leaving the terminal. The pick-up area is across the street and you won’t have wifi. Make sure to take note of the driver name and car license place to find them, exit the terminal and cross the street towards to meeting area. You’ll have to walk down a crowded ramp and will see posts with letters to to match the “bays” on uber. The cars will stop in front, but it is very crowded, so you’ll have to look closely for the cars to arrive and identify by the make, model and license plate! Insider Tip 2: uber allows for subcompact cars to be used for uberx, typically a Toyota Vios or similar, but I have had cars as small as the tiny Kia Picanto! While it fits 2 people with luggage, more people or large luggage won’t. For a family of four with luggage, I’d recommend uber Black, which usually is a mid-size SUV, for example a Toyota Fortuner with room for 7 or for 4 people with lots of luggage. Insider Tip 3: If you fit into an uberx, and face the dreaded surge pricing due to high demand, try the uber Black rates: uber Black is about 2x the uberx price, but doesn’t have surge pricing as often. So, if uberx surge pricing is higher than 2x, uber Black is not only more comfortable, but cheaper, too! Insider Tip 4: Terminal assignments for airlines and flights change frequently, so make sure to double check the terminal of your arrival at the official NAIA website here! Check out my other Travel Made Easy tips to get into the city and around town here! Read my Mini-Guide Manila for more information about the city! This article is so well written, complete with details…. so very informative. For a few months now, we’ve been searching the net if Uber (not just Grab) is finally allowed to do NAIA pickup and so happy to run into your article. We visit Manila yearly and this service is a welcome blessing for us and many tourists. We truly appreciate the time you put in writing your article…. and will be doing frequent visits on your site. Thanks for the feedback, have a safe trip to Manila and enjoy your time! So much old info on the web about Uber not being allowed to pickup at NAIA. I’m glad I saw your site. Thank you! This article is really helpful and maybe the holy grail of articles about how to use Uber at NAIA . Thank you for writing it. I have a question though. You mentioned that in Terminal 2, we can “call” Uber? But I don’t have a local sim card yet when at the airport. I’m gonna use my iphone and I suppose wifi is just enough to contact Uber right? I’m sorry it’s my first time to go back home in many years. I’d appreciate any help! At Terminal 2, you can use free wifi in the terminal, open the app and request an uber. Pick up is close to the terminal and wifi should be available curbside. Safe travels! Wow, this is cool. I’m going back home next month and thinking if I will be riding a cab. Now I will just ride an UBER. Well written with full details. Thank you so much. I read in other blogs that Uber is not allowed to pick-up at NAIA? Is this true? I would like to make sure. Thank you for your detailed info. There has been a lot of back-and-forth about uber operations in Manila, but currently there is no issue with uber picking up at the airport. The taxi operation at NAIA has improved recently, so if you are more comfortable with taxis, the lines for metered yellow airport taxis, fixed-fare white taxis and regular white, metered city taxis were much shorter on my last arrival. I wish to prebook an Uber ride from Naia Terminal 1 Qantas going to Purok 1 Mangan Vaca, Subic. Will Uber allow prebook and how hard to get an Uber to do such long trips? uber does allow pre-book in Manila, so you should be able to request a ride with your destination. I do know people who take uber frequently across the Metro area, but have not taken uber that far myself. A lot of uber drivers are full-time, professional drivers, who probably would be ok with the long trip (and likely empty return). If you are on a hard time-line for your arrival in Subic, a hired car & driver might be the safer bet. You can also find them at the airport, but they often ask for outrageous prices. For comparison, uber should be less than P1,500 for that trip, a car for half-day would be approx P2,500. Hi, I will be in Manila coming January 2019, Is it safe to use Uber from the airport to Quezon City? uber is no longer operating in Manila. But you can use grab instead. And, yes, I’d consider grab safer than a taxi, because the driver is known and your ride is tracked by the company! Hi. My friend will be arriving and i would not want to use rental cars anymore because of the convenience of Uber. Can u guide me thru, i will just wait for my friend to show up at the meeting area where letters of the last names are at the bays before arranging for an Uber pick up? Is this right? Thanks! Yes, that’s what I’d recommend. Wait for your friend in the meeting area, then call an uber when you are both there. uber x without surge pricing should be about PHP150-200 from NAIA3, a little more from NAIA1/2. Nice and useful information, I am planing to manila first time. Any more relevent informations regarding my trip. Hi! i would like to inquire regarding the price from ninoy aquino international airport to Phase 1 mabuhay city, mamatid Cabuyao, laguna. thank you. You can get a fare estimate from uber – click here! Hi. If I don’t have a smartphone, is there like a concierge there for Uber that they can assist me to get a ride with Uber ? I remember 2 years ago in Terminal 2, a lady called uber for me. Is it still available. Your website is such a blessing. On my last few flights, I didn’t see an uber booth at any of the terminals. But Grab offers a similar service and they do have concierges like that at malls, etc. Go look for a green both with white “Grab” logo on it and ask, they might be able to help you. Without a smart phone, you’ll probably have to pay cash, so make sure to exchange or use an ATM before you go! How much terminal 3 to CARDONA RIZAL? I don’t know the price for that trip, but you can use the uber fare estimator – click here! Please follow directions in the post to call an uber on your smartphone at NAIA T1. I don’t know the fare to Pampanga, but you can use the uber fare estimator – click here! You know that you start nice with all the information. However than you do make mistakes in your advice to help others. UBER rides ONLY within Metro Manila. From Manila you CANNOT get an UBER to SUBIC, ANGELES CITY or TAGAYTAY. Theirs licence are just for METRO MANILA or CEBU City. Further UBER also charge extra now for night ride and rush hour. But there are also other companies who drive you outside Metro Manila. for a reasonable price. uber fares are based on supply and demand, which can lead to higher fares during high-use times, but there is no fixed “night charge” or “rush hour” charge and it’s certainly not depended on traffic on EDSA. In either case, you will know what fare you’ll have to pay before you request a car. If it is too high, you can always choose a white, yellow or coupon taxi instead, if you think that’s better value! As I pointed out in the comments, I’m not familiar with rides to areas out of town and have even suggested to hire a car & driver at reasonable rates instead. I do recommend to avoid the drivers at the airport – the risk of a scam is just too high and the touts are a terrible experience for visitors to Manila. I wish the airport security would do their job and ban the touts! Lastly, I’m not sure your statement about uber’s license is true – they might only be allowed to pick up in a city, but don’t limit the distance of a trip. It’s common courtesy to advice the uber driver of a long trip – as they have to drive back empty. Please let me know if you pick up from the airport and drop to Bataan . Let me know how much the cost . sorry folks, I do not offer transportation from the airport myself! You’re a legend. Thank you so much for your detailed information. Just wondering if my uber app (australian) works in Manila or do I need to download a different version? 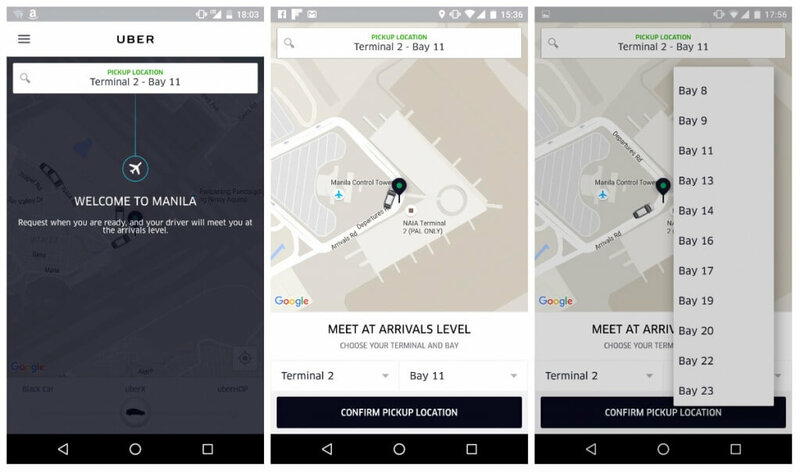 your uber app will work in Manila – safe travels! hello…i am about to travel to manila on 6th feb 2018…& would be staying on the first day at hotel luxent…i wish to travel to baguio on 7th feb…can u suggest if i can get a uber for drop off to baguio & if not uber…how can i find a safe & cheap transport for baguio drop off..thank you. Baguio is beyond the range of uber and I recommend to hire a car & driver for the trip, if you are a group. If you are traveling on a budget and/or solo, there are a number of bus companies offering this route. You can find a list of options here! Just wondering if my New Zealand Uber account will work in Manila? Also, do you suggest using Wifi when coming off the plane or when passing through customs? I’m unsure if the wifi network cuts off in the arrivals/taxi waiting area? It’s absolutely fine. I’d recommend to make the uber booking from the terminal and wait for the uber to be assigned, so you know the type of car and license plate. WiFi is typically strong enough outside on the curb, so you’ll be able to get update on the app while you wait. But just in case, I’d take a screenshot or note of the car and license plate, so you’ll hop in the right car! Happy to help, enjoy your trip and safe travels! you’ve got an amazing, courteous, pleasant, and extremely informative response to your bloggers. Thanks. Rupert I appreciate your website and informative messages listed. Great solutions. Thank you, I appreciate the feedback! Safe travels! With the recent acquisition of Uber by Grab in Southeast Asia, when will Grab officially take over the Philippines business? Grab was expected to take over two weeks after the announcement. But after Singapore, the Philippines are also looking into the competitive situation, so uber might operate longer in those countries. I will update this post, once the situation is final. Please subscribe to my newsletter to stay up to date! Hello, this is very helpful. I will be arriving in Terminal 1 on Tuesday. Do you know where is the best place to arrange for an Uber pickup at Terminal 1? Thank you . The best pickup area at Terminal 1 is in the arrivals area across the street in front of the terminal. There are signs with big letters, so you can give the driver the letter you are waiting at! This is so helpful .Thank you ! Terminal 4 is so small – should be easy to spot your uber. Keep in mind that uber is shutting down in SE Asia – time to download the Grab app instead! Can you please tell me which terminal in NAIA Korean Air will stop and if Grab or Uber is allowed to pick up at that terminal? Korean Air uses NAIA Terminal 1 and Grab is allowed to pick up at the airport. uber has shut down the app for the Philippines and is no longer available. Based on early social media reports, Grab prices are significantly higher than prior to the acquisition, so you might want to consider a metered taxi instead! Do you have any available at around 3pm at terminal 4? Sorry, I don’t offer rides from the airport. Please check my post How to get Around Manila for tips! Please can anyone help me for advance booking to picked me up in the airport from terminal 3 going my home whee 2 person with baggage. pls mesge me. Sorry, uber is no longer available in Manila and I don’t have a transportation booking service. You can read more about How to get around Manila! Hi! Can a friend pick me up on Naia Terminal 1? Is there a waiting area for relatives? Yes, MNL Terminal 1 has a waiting area for relatives. It’s organized by letter of the last name, so you should be able to find each other easily. If they pick you up with a car, they’d either have to park at the parking lot and meet you on foot or park off the airport and pull up when you are there – airport security won’t allow you to wait in that area, just loading. Safe travels! Hi, are there other “Rideshare” rivals to Grab in Manila since Uber has been banned?